First ice is upon us and all I have is thoughts of going brook trout fishing. Just before freeze up I hit a little lake and found the brookies doing exactly what they are compelled to do at this time of year. They were shallow, aggressive and preparing for the spawn. 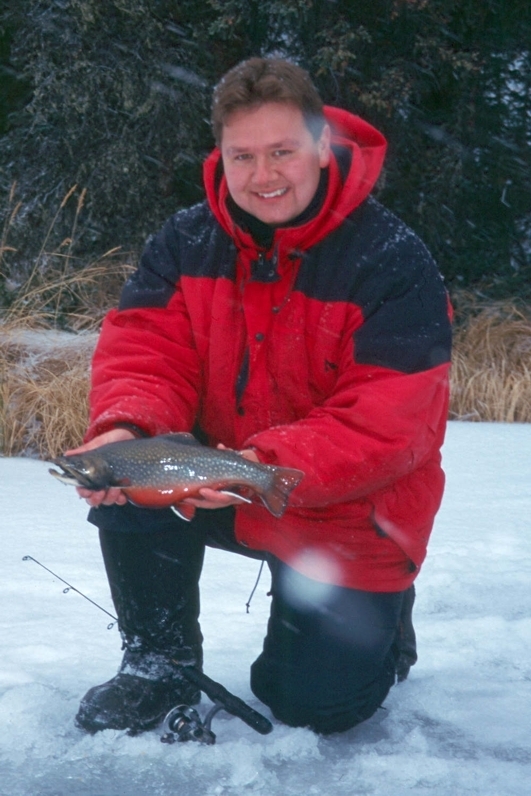 Brookies spawn just before freeze up and into first ice so his is the time of year we can go out and catch a bunch. First ice is much like watching brook trout TV. 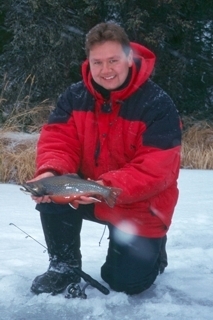 The brookies are notoriously shallow which means I will almost always be able to look down the ice-fishing hole and see the fish I am catching. Or in some cases, not catching. More on that later. 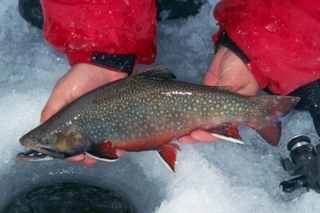 Brook trout come with their challenges and one of the biggest challenges is being able to not, that's right, not catch the little ones. When the larger, mature brookies move shallow to spawn they bring with them a whole host of little ones, eager as punch to partake in the feast. So, while I may be able to look down the hole and see a two pounder just sitting there, I may not get the chance to catch it. That's because there's an armada of wee four, six and eight inchers zooming about like wildfire eating practically anything I throw down. This gives me little chance at catching the bigger fish. Believe me, these little guys can and do eat practically anything. My buddy Trevor was so amused that he pulled a chunk of pineapple from the pizza he was eating put it on his hook and caught a brook trout. I have, however, found a couple tricks to defeat the little ones. 1) Use maggots or trout worms as they are more resilient and can stand up to the continuous abuse of little jaws crunching them. 2) Try not to set the hooks on the little ones. Instead, gently pull on the line after they've bit. Often they'll give up the bait, allowing it to continue it's downward drift towards the bottom. It may be picked up by yet another little one and if it does repeat the process. 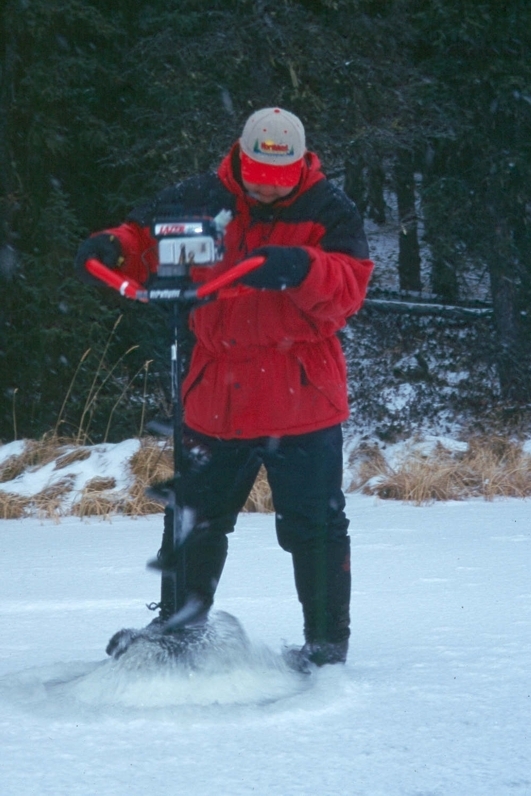 If lucky, the bait will make it to or near bottom long enough to get a chance at the bigger fish. They almost always bite on or near bottom. To catch big brookies consistently I subscribe to two theories. First, when I see big fish down the hole I stay put and get out the bait. Maggots, eggs and small trout worms threaded on a tiny hook keep me in the game. However, I only use eggs when I'm not getting punished by the onslaught of little ones simply because eggs are easier to pick off. Most days, regardless of effort, I still get a lot of small fish to bite, but they're fun in their own way. I recycle them while waiting for my opportunity for a big one to pounce. If I don't see fish, I move. I move quickly along the shorelines. That is, I fish the two to five foot depth generally no more than 20 or 30 feet from shore. I give a hole 10 minutes then move on. I only stop when I see or catch bigger fish. When moving in this search pattern bait slows me down. I want something I can pull out of an ice fishing hole, walk to the next one and drop it back down and be right back fishing. For this reason I use a small yellow marabou jig. If the fish are aggressive, which they usually are at the drop of the first hook, I'll get hit immediately. But, if I run a stretch of shoreline that I'm convinced has fish, but the little yellow jig has drawn a blank, I'll switch up and tip the jig with a piece of trout worm. This adds some flavor to the presentation but needs to be fished slower with a little more care. Regardless of whether I fish the jig 'as is' or tipped with bait I employ the 'run and gun' approach until I find fish or decide it's time to light a fire and roast a hot dog. When I do hit brookie pay dirt, it's fishing heaven. 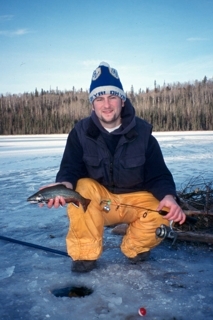 There are few other occasions where I can say that I looked down an ice fishing hole and seen six, seven, and on occasion even ten fish swimming around at the same time. 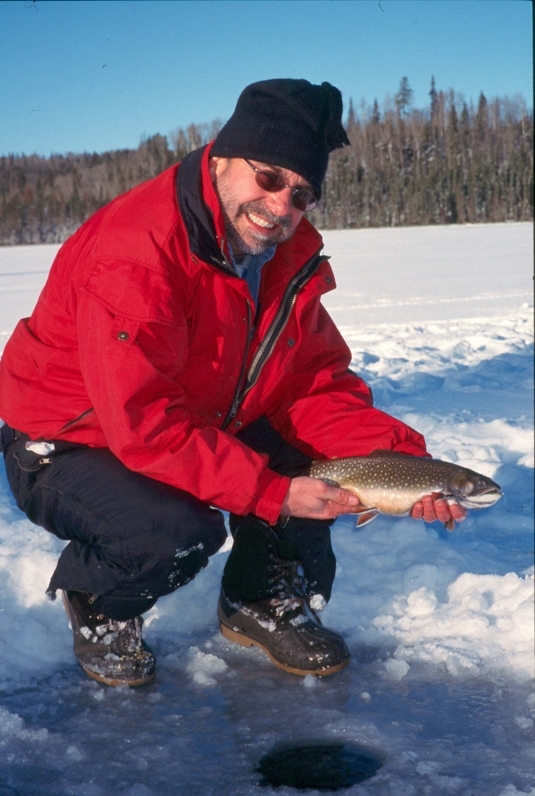 With brook trout, it happens often and it's a lot of fun. Bring a friend and they'll have a real thrill watching all the fish swim by. Keep a few and they'll be delicious on the frying pan. Bring the camera and snap a few photos when you do catch that first real big one. They're as pretty as they come.